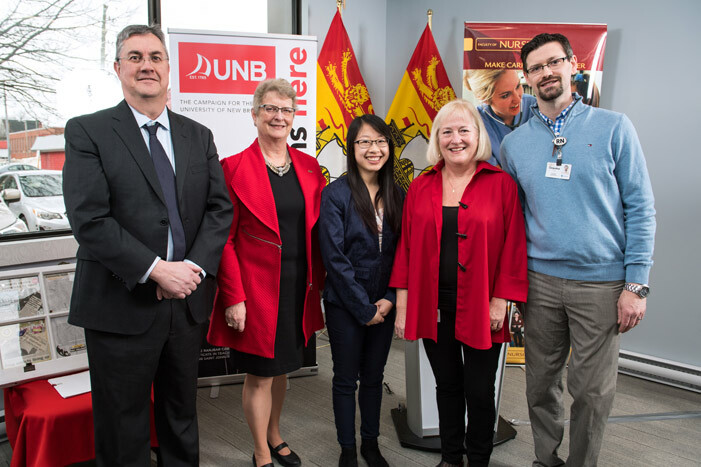 A key teaching and community resource for UNB Fredericton’s Faculty of Nursing now has a larger, improved home thanks to a partnership with Horizon Health Network and the Government of New Brunswick, as well as support from numerous donors. The Fredericton Downtown Community Health Centre (FDCHC) delivers an integrated program in which primary health-care services, teaching and research are combined. When it opened in 2002, the centre was one of only a few such integrated service-learning facilities in the nation and the only one with a focus on primary health care for the chronically ill. In 15 years, it has provided care to thousands of low-income and homeless patients and created educational opportunities for hundreds of UNB students. Over the years, the FDCHC has occupied a series of temporary sites in the downtown area. With the grand opening of its newly renovated location at 339 King St., the centre now has a permanent location, one that is better equipped to serve the needs of vulnerable populations living in the heart of the city and increase the opportunities for student learning. Nurse manager Joan Kingston says that the new location is large enough for the FDCHC to double the members of its interdisciplinary health team. This integration of service, learning and research in a community health centre is unique in Canada. While similar models exist across Canada, the FDCHC’s outreach and intersectoral collaboration components are distinct. The new location was officially opened today by Premier Brian Gallant. The grand opening was an opportunity to celebrate FDCHC’s achievements and to recognize the lead donors who made it possible. The T.R. Meighen Family Foundation’s gift to UNB’s last fundraising campaign, Forging Our Futures, helped develop and sustain the FDCHC. Over the years, many more donors, including Lois Walker Gillin (Hon. Alumna 2011) and Graham Farquharson (Class of 1964, DSc 2011) stepped forward to help the centre evolve into what it has become today.